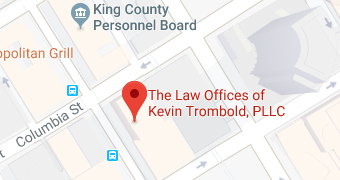 Kevin Trombold is a seasoned criminal defense attorney in Seattle who has represented – with astonishing success – hundreds of criminal clients in a number of courts across the state of Washington. Many defendants in the criminal courts have been wrongly accused, but if you become one of them, you don’t have to face your ordeal alone. Don’t let fear, uncertainty, and embarrassment take control. Immediately after being arrested, contact experienced Seattle criminal defense lawyer Kevin Trombold, and you’ll have a knowledgeable, determined, and level-headed advocate on your side. Mr. Trombold can guide you to the best possible outcome of your criminal case so that you can move forward positively with your life. Any arrest can damage your family, threaten your job, and humiliate you in the eyes of friends, colleagues, and neighbors. And any conviction for a serious crime will have ramifications that will haunt you for the rest of your life. For more than two decades, Seattle criminal defense lawyer Kevin Trombold has advocated aggressively on behalf of suspects accused of committing felonies and misdemeanors throughout the state of Washington. In some cases, his skillful negotiations outside the courtroom have led prosecutors to drop charges altogether. Whatever the details are in your case, Kevin Trombold will make sure that you are fully informed and entirely in control of the decisions that must be made regarding your defense. Kevin Trombold is a writer, a sought-after speaker, and a member of the American Academy of Forensic Sciences. He is recognized by the National Trial Lawyers Association as one of the top 100 trial lawyers in the United States. Kevin Trombold has represented hundreds of clients on criminal charges from driving under the influence (DUI) to domestic violence murder. If you are charged with a felony or misdemeanor in or near the Seattle area, contact the Law Offices of Kevin Trombold by calling 206-382-9200 at once to arrange for a free initial consultation.